As I’m writing this, it’s been almost two months since Ella was born. I know it’s cliché, but it feels like she was born yesterday and yet life without her seems so long ago. I’ve been wanting to write down the details of the day she was born but it’s been tough to sit down and type and while doing the new mom thing. I’ve loved reading these kinds of posts in the past so I hope you guys enjoy this as well! As I mentioned in my last pregnancy recap, even though my due date wasn’t until July 7th, I was pretty over being pregnant as the month of June wrapped up. However, for weeks beforehand Brian was worried that she would be born on a specific day: June 28th. He had a crazy day at work and was really anxious that I’d go into labor and he wouldn’t be able to get coverage. Since he was anxious about it I decided I would hold off on implementing all the old wives’ tales that I’d read about until after then. But you better believe I was reading up on every possible thing I could do after that. And I started walking like crazy because I felt like that didn’t really count. June 28th came. It was a productive day. We usually have our house cleaned the first Thursday of every month and I just had a feeling it would be better to get it done a week early, so I had our cleaning lady come that day. I went to the office to fill out some paperwork that I’d needed to get done, and joked with a coworker about how that might be the last time I was in the office before baby. I went home and cranked out 17 thank you notes that I’d been putting off for weeks. It sounds silly but those had been hanging over my head as one of the last things on my to-do list, and I felt like I’d accomplished something big. Everything else on the to-do list could wait. Brian got home from work and we decided to go out to eat to kind of celebrate that he made it through his crazy day at work. As we were getting ready to leave, I got this pain that felt like the Braxton Hicks contractions I’d been having for weeks, but this one actually hurt. I just laughed and said to Brian, “wouldn’t it be funny if I went into labor tonight?” We headed for dinner and I didn’t really think much of it. As we ate dinner, I had a few more of those pains. By then I told Brian I thought they might actually be contractions. I still thought this was hilarious and was giddy at the idea that I could be going into labor soon. We went home, took the dog for a walk (still having contractions the whole way), and I started timing them using an app that I’d downloaded weeks before. Finally we called Brian’s parents to come over and get the dog to stay at their house overnight, and though the contractions weren’t particularly painful yet, they were pretty close together. I called the doctor’s office at midnight to tell them that my contractions were five minutes apart, lasting a minute. She could tell from talking to me that I was able to talk through them. She said even though the timing was right, that until they were painful enough to take my breath away, I might be better off at home. I was all about staying at home as long as possible, so that’s what we did. I bounced on an exercise ball, tried to sleep from 2:00 – 3:00 (with little success) and generally just waited while watching TV. By 5:00 AM things were painful and I called the doctor again. They told me to head to the hospital, so I woke up Brian. 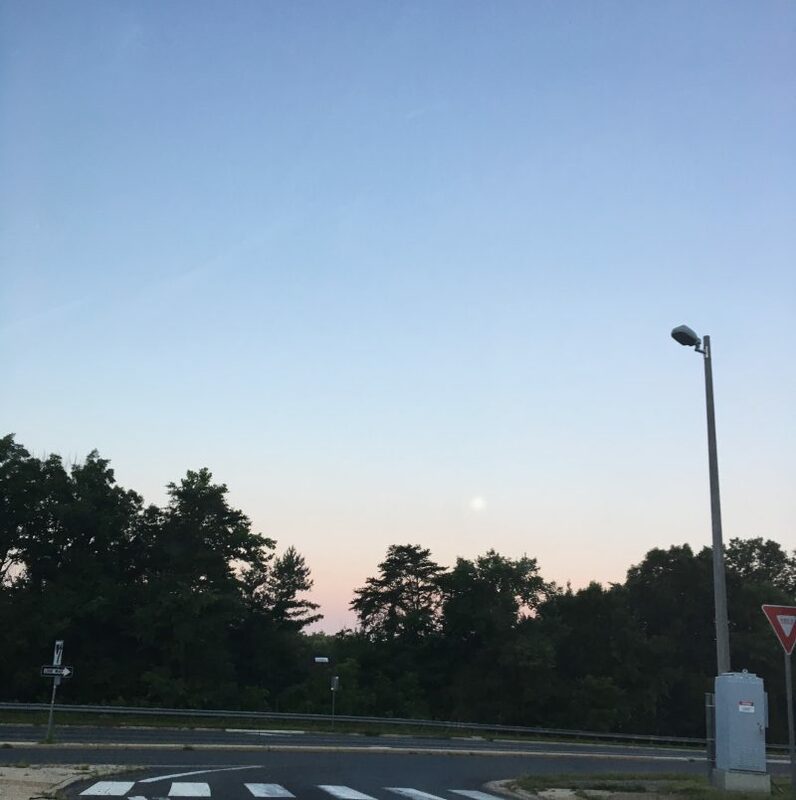 The drive to the hospital was so pretty – it was sunrise and the moon was big in the sky. We were both tired and quiet driving there. It was so crazy to think that our baby would likely be born that day! We got there and they put me in a triage room to check me first. My contractions were really painful at this point, and it didn’t occur to me that we might be there too early. Getting checked itself was super uncomfortable, and then we got the bad news that I was not close to being dilated enough to be admitted. They told me I could either go home and then go to my regularly scheduled appointment at 10:30, or I could stay in the hospital and walk around for a few hours to see if that did anything. I opted to go home. I was super cranky at this point – I’d been up all night, hadn’t eaten anything in hours, and was told to basically go home and suffer without drugs. I went straight to bed to try to sleep, which didn’t really work. Brian made me this cute little breakfast, which I ate and then promptly threw up from the contractions. Finally, it was time to go to my doctor’s appointment, which was in the opposite direction of the hospital. My mom came with us, and the whole way there I was having horrible contractions and I basically made everyone stop talking while they were happening. The time in between being discharged and my doctor’s appointment was by far the worst part of this whole process and I was super fun to be around, I’m sure. Once we got to the doctor’s office, they told me they didn’t think I was coming because I’d been discharged from the hospital that morning. However, they took me back and checked me right away. The nurse practitioner gave me the best news – I was 4 centimeters and could go ahead and head back to the hospital. We drove back to the hospital, and even though it was still a while before I felt better, I at least knew we were heading in the right direction. It took a long time to get my epidural at the hospital, and the nurse asked me a million questions that I swore I’d already answered when I preregistered, but I knew pain relief was coming soon so I still felt much better than previously. Once the epidural was in I became a much nicer person. That whole afternoon is a blur to me. I was really tired, there were people coming in an out, and I was just waiting but overall in good spirits because I wasn’t in pain anymore and one way or another I knew this baby was going to be born. My doctor checked me in the afternoon and I was only 5 centimeters or so, so they put me on some Pitocin to get things moving. I asked him when he thought the baby would be born, and he guessed somewhere between 11:00 PM and 1:00 AM. Of course, to me that seemed like a long time to still be going without food… always my main concern. At some point the nurse told me I should try to sleep to rest up for pushing later that evening. She got me set up with a peanut ball (it’s like this exercise ball that’s shaped like a peanut that they put between your legs, it’s supposed to help things get in position) and I napped on my side for like an hour and a half with that thing. When I woke up it was 8:30 or so, and the nurse checked me. Getting me off of my side was interesting because I couldn’t feel my legs AT ALL. I was really surprised when she said, “oh, you’re ready to go! I’ll go get the doctor.” Big fan of that peanut ball! I always envisioned that the pushing part of labor would be the most difficult and painful part, and that I would be easily annoyed by others during the process – that’s usually how I feel when I’m in pain and I tend to want to take it out on whoever is around me. It wasn’t like that at all. I couldn’t feel any pain, and the mood in the room was light. We were laughing and making jokes, and my doctor and the labor and delivery nurse were both awesome. Brian was amazing and somehow stepped into his role as “coach” and did exactly what I needed the whole time. Pushing was hard work and it took a lot of effort, but it didn’t hurt. From start to finish, I only pushed for about 35 minutes, and then she was here! She was born at 9:55 on June 29th. 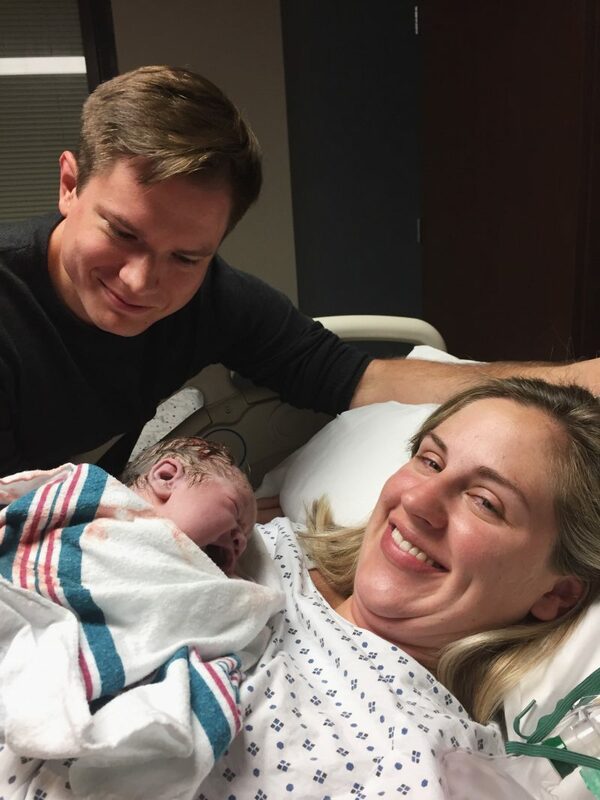 The look on Brian’s face when she was born was something I never want to forget. They almost immediately put her on my chest and it was so surreal to see her and hear her crying. The nurse took our photo a few minutes after she was born. As they were cleaning her up and the doctor was working on me, I could hear my mom laughing from the hallway. The nurse went out and shooed everyone away because it was still going to be a while before they could come in (turns out all four grandparents were standing out of the door listening the whole time.) Once we were ready, the grandparents came in and each took a turn holding Ella, and then the other family members that were there came in and took a peek. My sister brought me some late night Wendy’s. We were all exhausted at that point, so everyone left fairly quickly. We didn’t get to our room and get to sleep until around 1:00 AM. The nurse took one look at us an offered to take the baby to the nursery so that we could get some sleep. I remember going to sleep feeling so grateful and relieved that I wasn’t pregnant anymore, everything went so well, and Ella was here. Overall, I had a really positive birth experience. When I was pregnant I remember reading women saying that having their baby was the best day of their life, and I would always think, “how?? Giving birth sounds painful and miserable.” And while there’s definitely more pain and discomfort involved than say, getting married – there’s something so special about the day that you get to meet your baby. It’s a day I’ll remember happily for the rest of my life. Thanks for reading if you made it this far! Hoping to post about our early days with Ella soon! I was thinking about food the whole time too! :) Matt made my FIL go get me Jimmy John’s so I could finally have some lunch meat…and then my doctor told him to put the bag on the table in front of me so it would motivate me to push! I’m happy to hear everything went well! She’s such an adorable little baby and I’ve loved seeing pictures of her on Instagram.